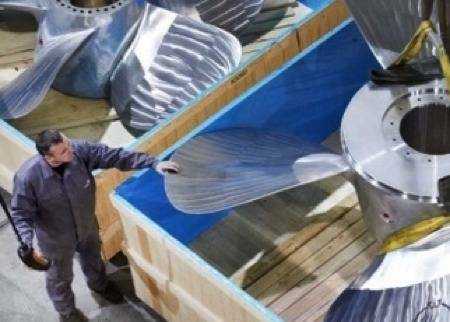 Van Voorden Castings BV from Zaltbommel, the Netherlands, has just completed a large order for four 25-tonne stainless steel propellers for a Canadian ice class ferry to be built by Italian yard Fincantieri for their client Société des traversiers du Québec. These propellers, of diameters 2900 mm and 3500 mm, have a combined weight of over 25 tonnes of high quality stainless steel and will be used for two contra-rotating podded drives. Van Voorden informs that because of the tough conditions in which the Canadian ferry will be operating it was necessary to produce the propellers of a high quality stainless steel. This resulted in thinner blades of the propellers and thus an increase in performance and a lower fuel consumption. Furthermore the stainless steel is better resistant against cavitation. The new ferry is to be classified by LR with the heavy ice class 1AS notation. Van Voorden says it is one of the very few foundries in the world which is able to cast stainless steel in this dimension and quality.